Fancy It Up: This is a great opportunity to make a meal feel special with extra flourishes, like a tablecloth and candles. In a nod to candy hearts, have family members write thoughtful sayings on colorful paper hearts and decorate the table with them. You could even play everyone’s favorite love songs during dinner. 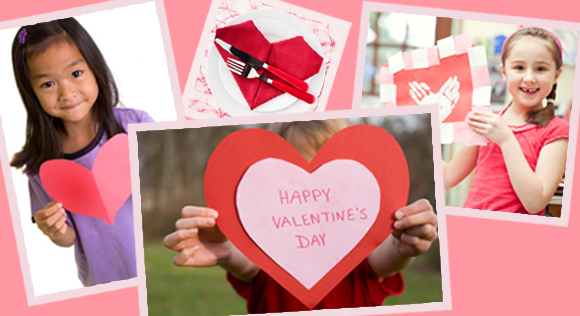 Dress in Style: Suggest that your family members come to dinner wearing something red, or even have them draw hearts on their faces (this works well for younger kids!). Cook Red Food: Ask your family to help you cook a red meal. The menu could include cranberry juice mixed with fizzy water, Tuscan bread soup (recipe below) and heart-shaped pizza. For dessert, the kids could bake velvet cupcakes or sugar cookies. Share Stories: What was your most embarrassing date? How did you meet an important person in your life? Sharing stories about romantic ups and downs can generate laughs and a sense of family history. 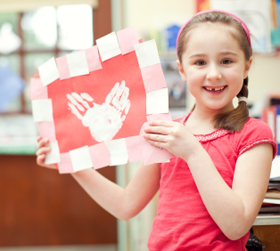 Before dinner or during dessert, have your kids make Valentine’s Day cards out of construction paper. They could be for other family members or for someone who might not usually receive a card on Valentine’s Day (like an older neighbor who lives alone). Placing an unexpected card in someone’s mailbox can brighten up his or her whole day. 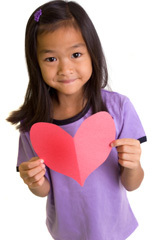 How many words and phrases that contain “heart” can you think of? Have your family members try to name as many as they can during dinner (examples include heart attack, heartbeat and heart on your sleeve). You can also play this game with “love,” “kiss,” “beauty” or “friend”!